It’s almost asparagus season! Which, is a reason to celebrate in my opinion. Spring produce makes me so incredibly happy, especially now that I live in the Midwest. Spring means asparagus, it means artichokes, it means that I can almost start planting my summer garden. And, most importantly, it means that I can swap in my flip-flops for snow boots because you can take the girl outta California but you cannot take California outta the girl. If temperatures rise about 45 degrees, you can bet that I’ve got my flops on. You can also bet that I’m firing up the grill, getting ready for a season filled with tofu kebobs, grilled vegetable platters and vegetable burgers galore. Sigh. I was made for warm weather. This grilled vegetable salad is delicious, perfect for any upcoming potlucks or BBQs. I started with grilling the asparagus, then thought about adding in some charred tomatoes. Then, I wanted to add just a bit of smoky grilled onion. And then I couldn’t get the idea of lemon and capers out of my mind. Well, sometimes I even surprise myself. The marriage of these ingredients just plays so well together. 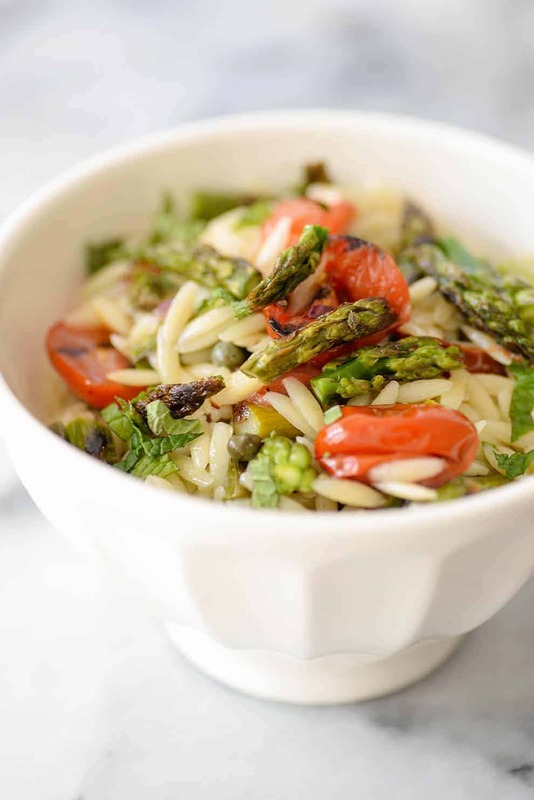 Tender orzo, soft grilled vegetables, briny capers, bright lemons and lots of parsley and mint. Wow, I loved this one warm, at room temperature and cold. I know I’ll be enjoying this one over and over again for the upcoming months. It’s pretty straight forward, so I don’t think you need any additional culinary tips from me. For convenience, I use my grill pan on my stove. Sure, it doesn’t quite give the vegetables the same infused flavor that a charcoal grill provides, but it makes this dish come together in less than 30 minutes which works for me. Enjoy! 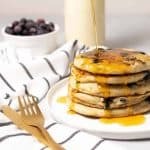 See how to make this recipe in the video below. 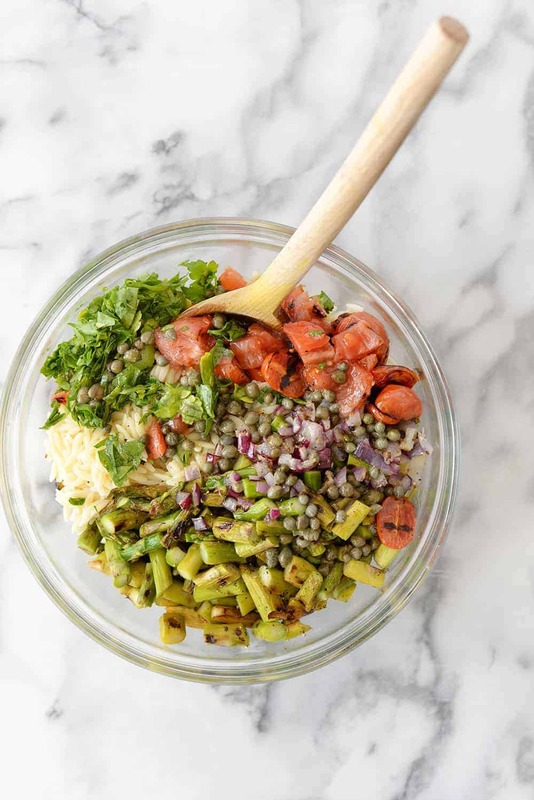 The perfect spring salad! 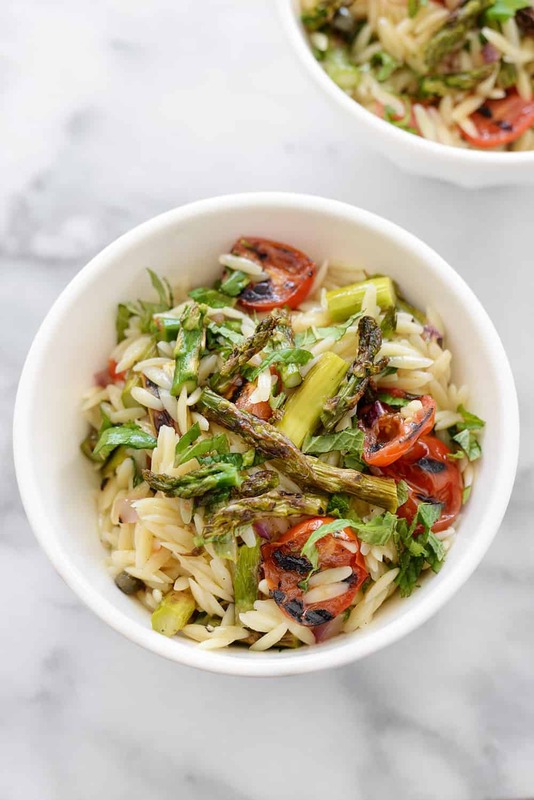 Grilled Vegetable Orzo Pasta Salad! A great lunch, dinner on it’s own or a side dish. Grilled asparagus, grilled onion and tomato and a lemon mint dressing. 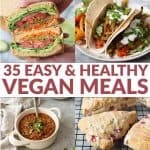 Vegan or Vegetarian. 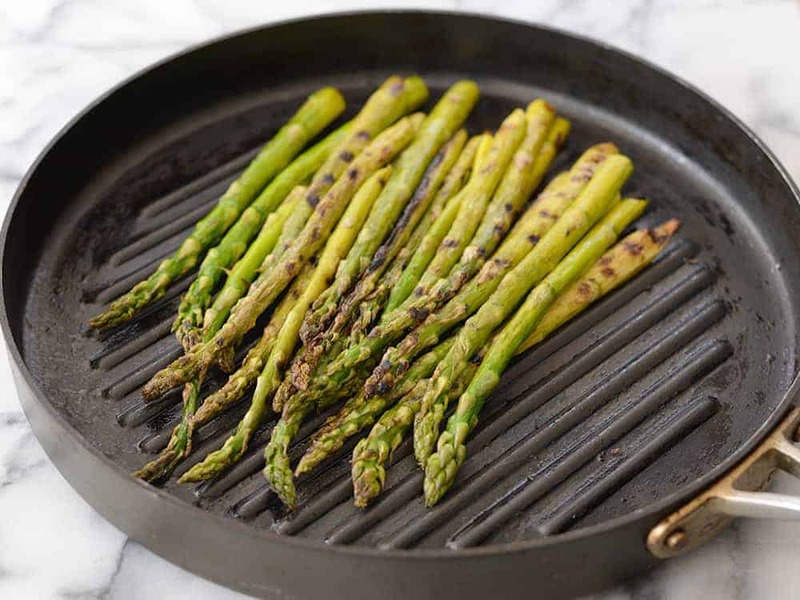 Heat a oiled grill pan or grill on medium heat. Bring a medium pot of salted water to a boil and add the orzo. Cook until just al dente according to package directions. Drain and lightly rinse. Place into a large bowl and set aside. Grill the asparagus spears, halved roma tomatoes and slice of onion until tender with a few char/grill marks. Remove from heat and chop the asparagus into 1″ pieces, tomatoes into bite size pieces and onion into a small dice. 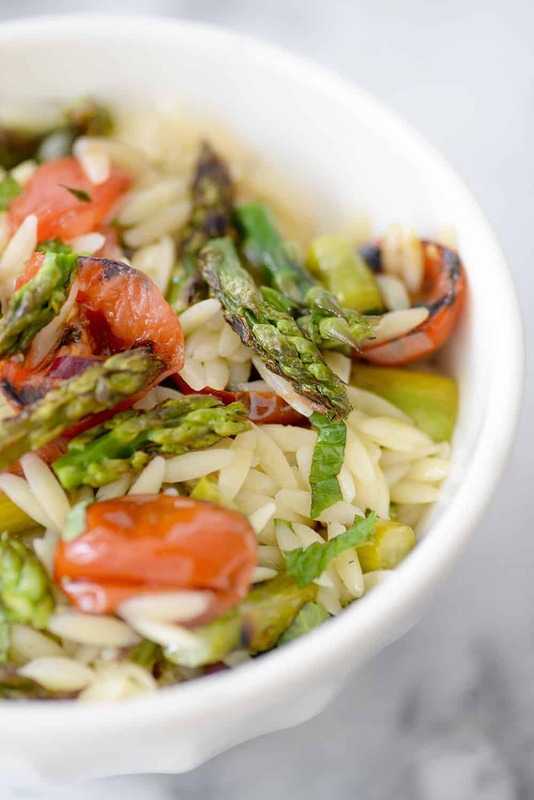 Add the vegetables into the bowl with the orzo. Whisk together the capers, lemon, dijon, maple syrup, salt and pepper. 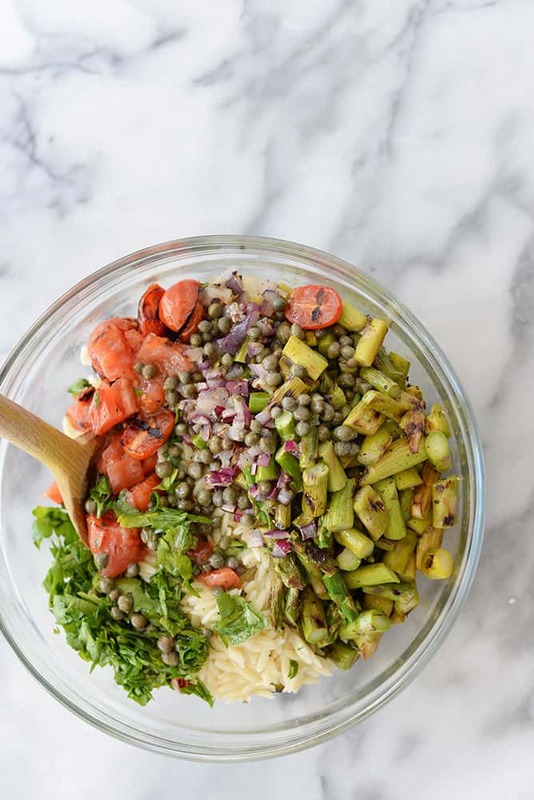 Slowly whisk in the olive oil to create a dressing, then toss with the vegetables and orzo. Add the herbs and toss again. Season to taste for salt and pepper. This tastes great warm or cold. The flavors develop overtime, so make ahead if desired and toss with fresh herbs right before serving. I’ve made this with goat cheese and feta before and it’s delicious! Add in with the warm vegetables to melt the cheese with the pasta or add chunks in to the cooled salad. Either way, it’s yummy.